Google announced a great new feature for search on Android today. 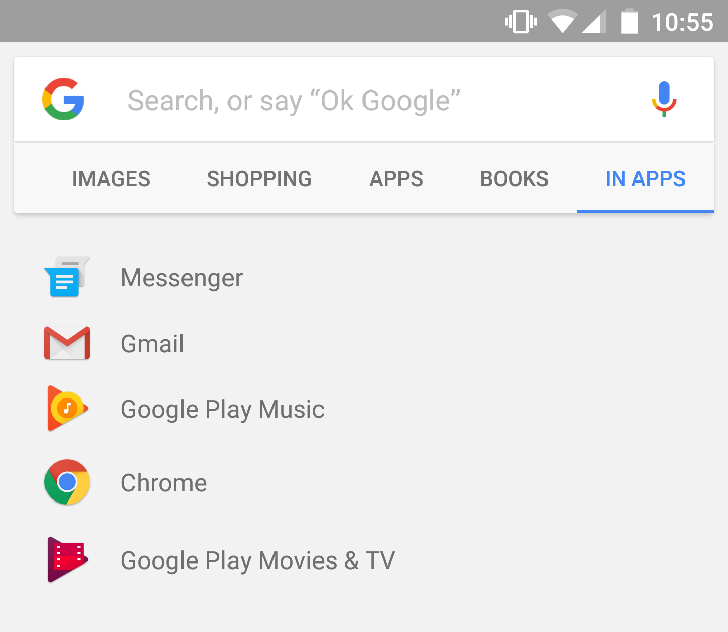 “In Apps” is the name, and it’s simple: when you search Google for something, a new “In Apps” category will pop up alongside the usual cast of Photos, News, and the like. If you’re searching for info on a song, using In Apps might bring it up in Spotify, YouTube, or Google Play Music. The same goes for contacts in Gmail or notes in Evernote. Google says the feature is available today for Gmail, Spotify and YouTube, with Facebook Messenger, LinkedIn, Evernote, Glide, Todoist and Google Keep coming over time. We imagine more apps will be added even further down the line. Beyond that, Google also seems to have partnered with LG to promote In Apps on the LG V20. LG will be the first (and only, for now) phone to have a shortcut dedicated to In Apps searches. It’s no big deal for everyone else to have to go to the Google App and press the In Apps tab, but it’s cool, we suppose. LG’s pre-installed apps will also all support In Apps. Nexus 5 and an LG phone. No, it probably isn’t the V20. The new In Apps feature should be rolling out to the Google app starting today so make sure you get yours updated as soon as you can.